Neostore is a commercial name for battery storage and for a home energy management and storage system. The system controls the consumption of energy generated from the public network and different alternative resources – photovoltaic panels, wind turbines and battery storage (HEMS – Home Energy Management System). The product was developed by Robotina for its strategic partner, Neovoltaic. It includes electrical and mechanical design, a complete control system based on Cybrotech controllers, and a web application that provides an overview of all the relevant data of each HEMS device. Neovoltaic expects over 1,000 installations in Germany over the next three years. The problem that needed to be solved was twofold. We had to provide the suppliers with an appropriate tool for control and maintenance of all devices and equipment installed in order to take timely preventive actions in case of deviations from the normal mode of operation and to ensure the fullest possible information about the modes of operation in case of failure. At the same time, we had to provide the end users (customers) with a simple insight into the operation of their systems, with an emphasis on displaying energy savings. All together had to be provided as SaaS. Neocontrol web application was developed, based on SMIP platform. The application allows the equipment sellers and installers to generate a “control panel” for each HEMS device installed. After authorising it with a code, the device owner can immediately obtain data on the state and production of the equipment. All operational data are promptly processed and analised on the Smipcloud.com server. The operator can set warnings and alarms for any group of devices. They are triggered in the event of deviations from the set values, sending notifications to the responsible staff. The application also enables activation of the so-called service regime, where any group of devices can be monitored in detail (with an extended range of measurements) for a longer period. 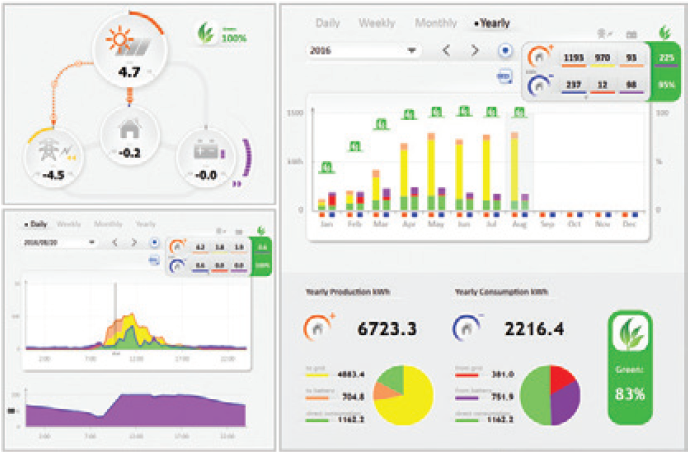 Finally, the application prepares periodic weekly and monthly reports on the operation of all devices, as well as produces and sends dedicated monthly reports containing measurements of the “green” consumption efficiency, which represent a basis for subsidising investments in alternative energy sources. The Neocontol application provides Neovoltaic with a simple support for each device installed, access to the control data of each device and alarm setting enable the company to take preventive maintenance service actions. The possibility of starting a service regime as well as obtaining and storing additional measurements for a longer period allows the company to correct errors quickly and professionally. Ends users (customers) are thus guaranteed a quality service. The username and password allow them to access their “control panel” containing current and cumulative data through the same web application. The historical review of the efficiency of the device, the so-called “green” efficiency factor or the factor of self-generated energy and the energy delivered to the grid, is especially important to them. The option allowing the customers to monitor their production and consumption attaches an enormous value to the product in terms of quality and makes it clear that the investment pays off.